This little guy is ready to swing from the vines and chill with his animal pals! Want your Jungle King to become a Jungle Queen? Make the loin cloth two rows longer and it becomes a dress! Tie the hair into a ponytail or pigtails! Have fun! 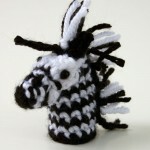 Finger puppets take just a tiny bit of yarn – don’t stick to my color suggestions, use what you have laying around! Row 1: Starting with magic circle, 5sc into the circle. Join with sl st and ch1. Row 2: Work 2sc into each st. (10 sc) Join with sl st and ch1. Stop here for a moment and weave in the starting end while you can. Row 3 – 10: Work even around (10sc). Join with sl st and ch1. Row 11: Work even around. Break yarn and use seamless join to finish off, weave in end. 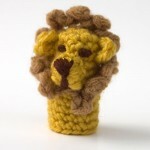 Cut about thirty 5″ lengths of yarn, and using tapestry needle and knots, apply to head in desired pattern. 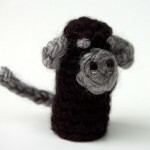 Using one more piece, add french knots for eyes, or sew on plastic eyes/buttons. Run the end into the hair and tie it to another piece – no end to weave in this time! 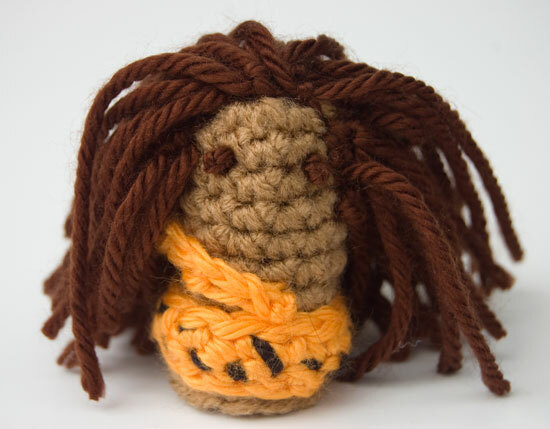 With orange yarn, ch12. Sc in second st from hook, and sc to end. (11sc) Ch1. Using a foot length of the black yarn and the tapestry needle, embroider small random dashes and marks onto the loin cloth. Sew the cloth one row up from the bottom of the body. How’s your puppet collection coming? 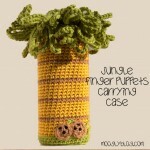 Complete the set with the Lion, Zebra, Monkey, and Jungle Finger Puppets Carrying Case – it makes a great gift! Be sure to check out the moogly facebook page for the latest updates and fun extras! Written pattern copyright Tamara Kelly 2012, please use a link to this page when sharing this pattern with others, but do not copy, repost, or redistribute this pattern. You can contact me at [email protected] or via Facebook messages.